I’ve always wondered what it is about Bombay that’s so fascinating. Why I’m never able to fall asleep in the taxi after a long journey. Why I stay glued to the window, watching the crowded buildings, crowded footpaths, crowded roads dotted with rickshaws, sedans, bicycles and bright yellow taxis, as I inch forward with the bustling traffic. Makes me wonder what it is about this humid, chaotic place that makes it India’s most celebrated city. Few can leave Bombay without falling in love with her. There’s something about the heavy sea air, the fading paint on the buildings, the sudden rains and the carpet of people that stretch endlessly before you that arrests your attention instantly. The chaotic, confused bustle creating an intriguing distraction for anyone who walks her streets. But if you listen closely, you can hear Bombay’s thundering heartbeat. The constant, rhythmic sounds of shuffling footsteps, crashing waves, and wheels against train tracks, beat tirelessly through the familiar bustle. You realize it’s what keeps her alive. That every person on her streets carries a part of that sound with them without ever realizing it. That it’s only when you step out of Bombay and into another city, that you realize how easy it is to know something’s amiss. Bombay rains with childish unpredictability, throwing tantrums with her sudden bursts of harsh showers. Those who’ve lived with her react to her short temperament with loving resignation. The sudden shower dissolving the crowds into the stalls, buildings and shops instantly. Her sudden tantrums are simply embraced with an air of dutiful acceptance by everyone who has known her long enough. Within minutes, umbrellas are opened, wipers are turned on, rickshaws unfold a curtain of thick plastic along the sides. Life continues to inch forward with casual nonchalance. And the rain in Bombay continues to pour, dampening everything but her spirit. Bombay is a woman who doesn’t believe in makeup. Wearing her scars with the same pride that she wears her skyscrapers. What’s most striking about her is that she makes no apologies for who she is. Carrying her slums and sprawling bungalows with an air of effortless indifference. You realize that the perfectly manicured lawns, the glistening sea and sparkling city lights make no attempt at hiding her dark underbelly. The dense carpet of dimly lit slums contrasted starkly by the twinkling skyline, prove just how cold and unforgiving she can be. 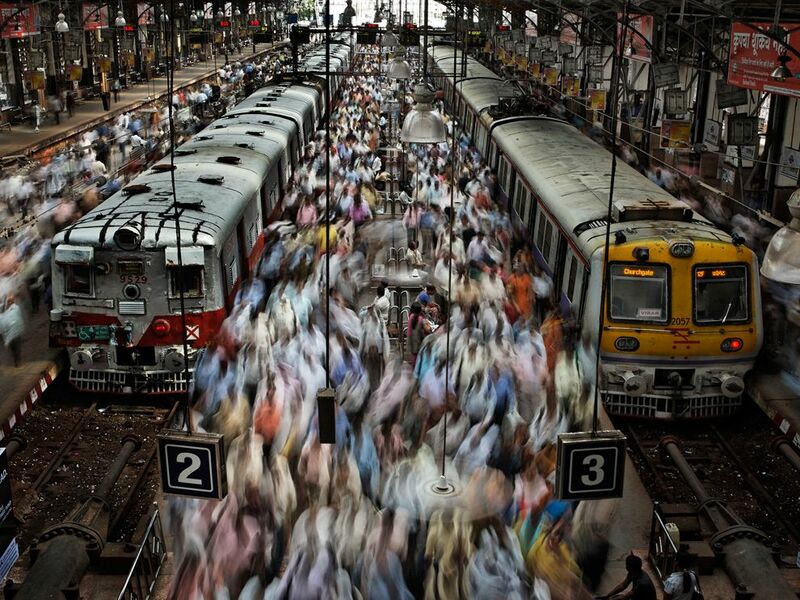 It makes me realize, that there is something about Bombay that is so vague, so unexplainable, yet so tangible, that makes people with the most radically different lives, from those who land at Terminal 2 to those who rush to cling to the doors of moving trains, call the same place their home. That it’s only when you soak in her raw, bitter-sweet beauty, that you realize why it is the face that launched a thousand ships. Laden with a thousand agendas, hopes and dreams from across the country. Bombay is a beautiful potpourri of contradictions. With the highs and lows tangled up in each other in most effortlessly intricate way, the streets of Bombay are a perfect metaphor for life itself. One that reminds you that there will always be an endless horde of people walking behind, beside and ahead of you. That you will always struggle to maintain your lead, that you will always struggle to keep up. That quickening your pace doesn’t mean you’re going in the right direction. That at the end of the day, though we walk down different paths, we’re not all that different. Just a chaotic endless horde struggling to make our mark, find our place, or simply get on the right train before it leaves us behind. Well said. If I may add: her denizens are very professional in their approach. If we ever come up with an index of the Ease of Doing Business kind, within India, Bombay would be ranked no. 1. If people say some thing, they try their best to deliver! What can I say? You take the words from my mouth. You speak out my hidden secrets. You make the unclear crystal clear. I love every single word that you’ve said about Bombay not because it’s true, not because it’s my home, but because every word rings with a car horn, smells of the perpetual dust, and feelings of the warm sunlight heating you from within. There was one thing that struck me this summer while I was in Bombay. I had heard the metro had come up, and I had to try it out, along with the monorail. To go back to your point, seeing the slums through the windows of new mode of transport, a new generation, and a new life makes Bombay seem even more beautiful. In the sense that she can pull off anything with ease and beauty, and how far she has come from where she all began. It almost makes me humble and sad. Though I have been in and out of Bombay just for my wedding shopping, I can see your point.. Bombay fascinates me.. I wish someday, I can experience it too! I love it. Its my home and how much ever I complain… I would never live anywhere except here!!! So thoughtful this is. Beautifully put! For some reason, I miss Mumbai now, despite living in her. I loved the way you have tried to understand my city. And rightly said, the moment we go to another city, we start missing Mumbai. The variety available in the city is amazing for every palate and every wallet. One can always have a good time here in Mumbai. So true Krshna. I live in Mumbai and live Mumbai every day…I find its putrid stench aromatic, the slums and peeling paints beautiful and the millions of people therapeutic. Though I curse its predictable rains and predictable traffic congestion, I know I will have it no other way. I find its spirit indomitable, this is my adopted city. Majhi Mumbai, aamchi Mumbai. So true Krshna…I live in Mumbai and live Mumbai every day. I find its putrid stench aromatic, its slums and peeling paint beautiful and millions of people therapeutic. Though I curse the unpredictable rains and the predictable traffic congestion, I will have it no other way. Its spirit is indomitable and I love my adopted city. Majhi Mumbai, aamchi Mumbai. I could only nod my head in agreement with every word of yours… Bombay for me is a city with which I identify myself.. I hope someday I get to experience Bombay like a true locale… Right now it’s just visiting her every now and then… Oh, how I crave Bombay! Love the “Bombay is a woman who doesn’t believe in makeup”! Hi I know its strange I am commenting on this again but seriously couldn’t suppress my desire to do so , the more I read this post the more I am filled with appreciation its just prefect. Thank you for writing this.